Reads All The Books: Don't let this one Float by! What if your only memory is of who you aren't, not who you are? 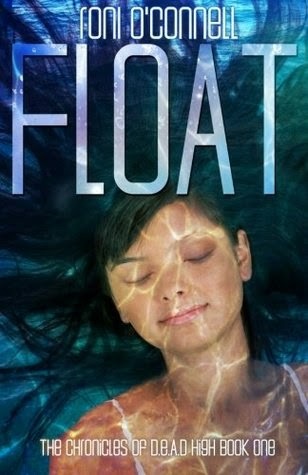 Seventeen-year-old Rashelle Santos fights her way out of a coma to find she doesn't remember her life, except for her parents and dog. Brain damage doctors tell her, but Rashelle knows with absolute certainty that Shellie (her nickname) died at the bottom of Kaweah Lake, bequeathing her death memories to Rashelle. Rashelle leaps into a relationship with Shellie's boyfriend, Aiden Brody, because he stirs her feelings and fills the void within her. As their relationship becomes serious, she questions whom he really loves. When threats appear in the form of notes stuffed into her locker and calls in the night, Rashelle wonders if she can stay alive long enough to discover who wants her dead, because somewhere out there Shellie's attacker watches and waits to finish what he started. And what the hell, she wonders, is she deranged or could dead Shellie be lingering to keep her alive? What do I say? This book had me in knots the entire read. Constantly questioning, plotting, wondering. I wanted to flip to the end so badly (don't do it, don't be that reader. *winks*) and get to all the answers because I needed to know! I am ever so glad that I didn't, I literally sucked in the breath I hadn't known I had been holding and came close to shouting out all sorts of expletives that would have woken my children (seeing as I didn't stop reading until I was through at 1 am.) when everything became clear. Rashelle, our heroine wakes up in a long term care facility to discover that she nearly died 9 months ago (Hmmmm, 9 months ago!) in a horrific and brutal event. Only everyone keeps calling her Shellie and while she knows that is who she was, it is not who she is! For the past couple of weeks, I've debated internally over whether or not to confess an impossible truth. Dad and mom have aleady suffered for months, and I won't willingly cause them more shock and pain. Right from the start, I pretty much knew, but they are wonderful parents and don't deserve any more crap tossed their direction. So, I commit to the deception, but I need to say it aloud, just this once, behind the privacy of my closed door, here where it is safe to acknowledge. On top of struggling to find her place in society, with her parents, and especially with in her social network as Rashelle (someone who is almost the polar opposite of the girl everyone wants to keep believing she is) Shellie's killer is still out there and is stalking her in more than just her nightmares. On a whole I loved this book. I think it is something we (or at least I) haven't seen often in YA, a paranormal thriller. It definitely will keep you glued to your seat and reading. There are some difficult and graphic moments in this book which is why I would recommend it to anyone 16 and up. If you have a younger teen that would like to read it I suggest reading it along with them. One of the best things about Rashelle is that she doesn't let her situation control her, she fights everyday to control it and to overcome. Yes there is some disassociation that goes on due to the premise of the book, but she is by no means a weak heroine, she is a strong, independent (but still looks to her parents for guidance and support as well as looking to her friends for support) fighter and I really loved that about her. So why not 5 stars? Well, and it is likely just me, I struggled through a good portion of the book trying to decipher the Rashelle/Shellie identity conflict. I'd go from she's got amnesia and it will all come back, to there must be a ghost, to she's got to be Schizophrenic, lol. But while I was writing this review I started thinking more on that problem and it made me look at Rashelle a bit differently. Considering the fact that this is how I felt as I read the book, how must she have felt living through it, knowing who she was, knowing that somehow it was more than just lost memories and having everyone even herself at times wondering if she was crazy. I won't call this an easy read, there is a lot going on, a lot to process, but it is well worth taking an evening and settling in for a great read. Trust me you will never see the end coming! As always here are your buy and Goodreads links! And don't forget to enter the giveaway...A Kindle Fire!!! Thank you...I wanted to say so much more, but I can't with out fearing I'll give something away, lol. It was a fun book to read and like I told you, the more I sit on it, thinking about it the more I like it. 😊. And I can imagine, does your tongue hurt from biting it, haha! Thank you for sending it my direction!